To get married you will need to raise your music note level with the marriage candidate. You can do this by giving gifts and talking to the person each day. Participating in festivals will also help to raise your affection with your chosen sweetie. You will also need to see the person's four music note events, which trigger at 1 music note, 1.5 music notes, 2.5 music notes, and lastly at 3 music notes. These events are triggered whether you are playing as a girl or as a boy farmer because they all unlock special memories. The person's last music note event will trigger when he or she is visting your farm; the Events page lists the schedule of farm visitors. After you have seen a potential marriage partner's four memory events, Rowan will visit your house the next morning to instruct you to go talk with the Harvest Goddess. Head up to the mountain shrine and meet with the Goddess. 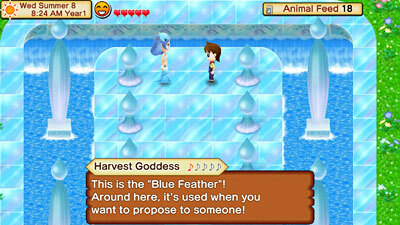 She will give you the Blue Feather that you'll use to propose marriage with the person you want to marry. You will find the feather at the bottom of your Tool inventory in your bag. The Goddess will remind you that you need to upgrade the size of your house so that it can fit two people. This can be done by remodeling your house to the Large House. Bring 5 Mithril, 10 Glass, 40 Hardwood Lumber, and 85,000 G to Brutus to complete this requirement. House upgrades are completed immediately after you order them. Once you have completed the marriage requirements, talk to the person you want to marry. You'll both go talk about the proposal at the town plaza. The feather will then be used to confirm the committment between the two of you, and the wedding will be planned to take place in 7 days. On the day of your wedding ceremony your fiance will fetch you when you awake in the morning. 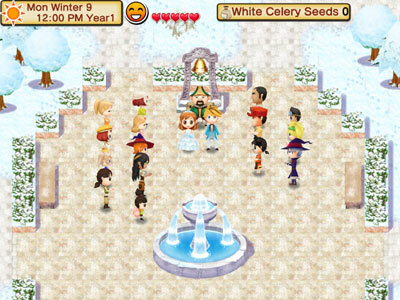 Everyone will gather in the Chestnut Town plaza to witness the marriage, with Sam overseeing the ceremony. After the short scene you will return to your farm house at 10:00 pm. You won't be able to care for your crops or farm animals, but it will be okay. Your crops won't grow on your wedding day and your animals won't get sick. The next morning you'll be awaken by the villagers. They all had a dream about the tree on you farm and have gathered to investigate. They slowely begin to remember all the good times they had on the farm with the previous owners. Far in the distance they'll also hear the Bell of Memories ring. After everyone leaves, the three Harvest Sprites will thank you for restoring the vitality of their Sprite Tree. You'll be rewarded with The Sprite Tree memory and +1 stamina heart. Each year on the anniversary of your wedding, go into your farm house between 5:00 pm and 8:00 pm to celebrate with your spouse. You will also spend New Years Eve and Starry Night with your spouse. You need to have an even larger house if you want to have children. Brutus will have a Giant House upgrade available for 400,000 G, 50 Hardwood Lumber, 3 Adamantite, and then your choice of one of the following materials: 20 Wool, 15 Great Wool, 10 Ultimate Wool, 5 Fluorite, or 5 Opal. Now that you have the Giant House, you'll need a crib for the baby to sleep in. This becomes available in Brutus' shop once the Giant House has been constructed. The crib costs 2500 G and requires 5 Hardwood Lumber, 1 Silver, and your choice of one of the following options: 5 Wool, 4 Great Wool, 3 Ultimate Wool, 2 Supreme Wool, or 1 Miracle Wool. You can build the Giant House and the Crib before you get married. The pregnancy event will trigger when it has been at least 15 days since your wedding ceremony and if you have the Crib inside your farm house. After Hanna announces the pregnancy, your spouse will wonder if it is going to be a boy or a girl. At this point you can select the gender you would like the baby to be. This pregnancy event will last until 3:00 pm. In the morning after 40 days have gone by, Hanna will be brought to the farm house to help with the birth. You will receive a Rattle, a Bottle, and some Baby Formula. You also will have to give your new child a name. The birthing event will end at 3:00 pm. Starting on the day after its birth, feed the baby by giving it Formula Milk every day. You will find it in your Cooked Dishes section of your bag inventory. You can buy more Formula Milk at Hanna's Restaurant for 100 G each. She also sells the kitchen recipe for 50 G. To make it yourself you'll need to use either 2 Milk, 1 Great Milk, 1 Ultimate Milk, 1 Supreme Milk, or 1 Miracle Milk; the quality of milk won't add any benefit to the resulting Formula Milk. You will also want to raise its friendship by using the Rattle. You'll find the Rattle in the Tools section of your bag inventory. Tap on it from your bag and then tap on your baby in its crib to use the Rattle. If you forget to feed the baby Formula Milk, it will increase the amount of time it takes to grow to the next stage. 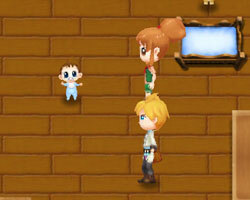 You can give other food items, such as Fried Egg, but its growth is based on Formula Milk. Each day you forget to give it Formula Milk will increase the time it takes to move to the next growth stage by a day. You do not have to use the Rattle every day. The baby will stay in its crib until it is 30 days old. On that morning you'll wake up to see it crawling around the house. You will also unlock the Crazy for Crawling memory. You will still be feeding it Formula Milk every day. It also takes naps in the Crib throughout the day. After another 30 days have gone by, in the morning you'll awake to see that it now is walking around. You'll also unlock the First Steps memory. The baby will still appear to crawl around on the ground though. Another 30 days later, in the morning you'll see your child say its first words. You'll unlock the Talk Talk memory. Continue to give your crawling child Formula Milk every day. The last growth stage is another 30 days. Your spouse will give you a Picture Book to use to play with your mature child. At this point you don't have to feed the child Formula Milk every day; you don't have to feed it at all if you don't want to. You'll also find it out and about outside of the farm, but it won't help you with your farm chores. The child will sleep in your bed, between you and your spouse. The pregnancy event for your second child won't require any extra conditions. It will trigger 7 days after your first child grows up. The same steps will then occur as it did with your first child, but this time you won't get to select its gender. Your second child will be the opposite gender of your first child.